There are helpful statistics and there are bogus statistics. This is a helpful one and it actually confirms the message of a variety of other indicators. In the process we also clear a big misconception. It’s official, the S&P 500 lost 3.6% in the first month of 2014, the Dow Jones (DJI: ^DJI) closed 5.3% lower. According to the January Barometer (as January goes, so goes the year), that’s bad news for the entire year of 2014. There is a lot of truth, but also a lot of misconceptions about the January Barometer (JB). Here are the facts, and nothing but the facts, based on S&P 500 (SNP: ^GSPC) data going back to 1970. 1) The JB has been correct 27 out of the last 44 years, or 73.3% of the time. As far as investment odds go, that’s pretty good. 2) In addition to the JB, I also track the Santa Claus Rally (SCR) and First 5 Days of January (F5J) indicators. In 2013/14 the SCR had a positive return, F5J and JB were down. 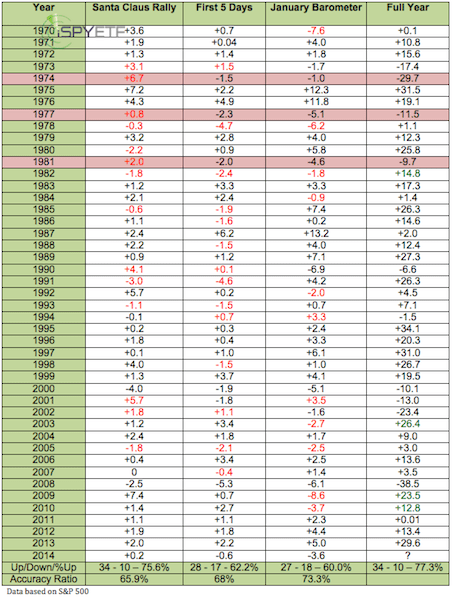 As the S&P 500 return table below shows (rows shaded red), there have been three such instances since 1970 (1974, 1977, 1981) when the F5J and JB were down, but the SCR up. All three early warning signals were followed by sizeable full-year losses (29.7%, 11.5%, 9.7%). Let’s take a look at that ‘perfect record.’ Since 1970, there have been 17 prior down Januarys. Only eight of them were followed by full-year losses, an accuracy ratio of only 47%. January losses in 1982, 2003, 2009, and 2010 were all followed by 10%+ corrections and full-year gains of 12.8% – 26.4%. To call this an indicator with a perfect track record doesn’t seem quite right. It’s also possible to run the numbers based on the Dow Jones and/or go back to 1950, but the basic takeaway remains the same: Statistics suggest the S&P 500 (NYSEArca: SPY) and Dow Jones (NYSEArca: DIA) have a tough year ahead. Statistics like this are interesting and they are a piece of the market forecasting puzzle, but they aren’t a stand-alone indicator. Market’s sold off following the Fed’s taper announcement and Wall Street was bracing for lower prices, but this trusty little VIX indicator triggered a surprising signal. The December 13 article on the incredible VIX indicator drew a lot of feedback and requests for updates. Now is an appropriate time for an update. Before we look at the actual indicator, here’s a quick nutshell summary on how this particular VIX indicator works. The ‘incredible VIX indicator’ is a simple ratio of two short and long-term ‘fear gauges.’ We use the VIX (Chicago Options: ^VIX) and VXV. The VIX reflects how volatile traders expect the next month to be. The VXV reflects how volatile traders expect the next three months to be. 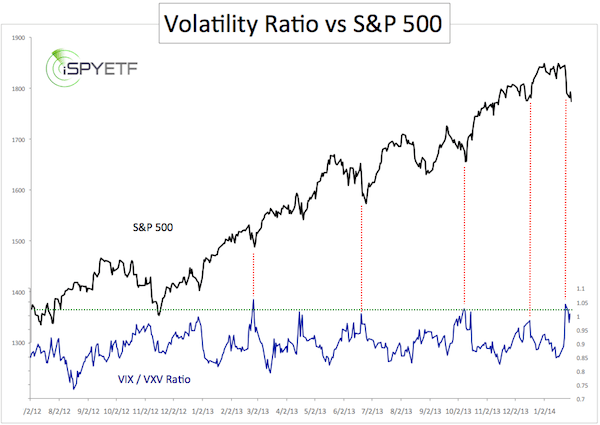 The expectation of increased short-term volatility relative to long-term volatility (VIX/VXV ratio above 1) is usually a contrarian indicator, which means short-term volatility is about to level off and the S&P 500 (NYSEArca: SPY) or other indexes are about to move higher. The chart below plots the S&P 500 Index against the VIX/VXV ratio. Over the last four trading days the VIX/VXV ratio (based on closing prices) peaked above 1 three times. The red lines highlight the S&P 500’s reaction to VIX/VXV ratios of 1 or higher. 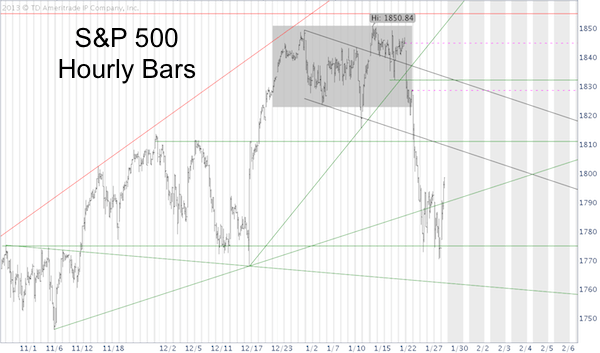 The hourly S&P 500 chart below shows some of the trend lines and key levels we’ve been following. Although the current bounce should move higher, the weight of evidence confirms the Profit Radar Reports 2014 Forecast, which proposed a correction starting at S&P 500 1,855. Today’s rally should have further to go, but ultimately lead to lower lows. If you trade VIX vehicles like the iPath S&P 500 VIX Futures ETN (NYSEArca: VXX) or VelocityShares Daily Inverse VIX ETN (NYSEArca: TVIX), you’ll find the trading tip offered here insightful. Simon Maierhofer is the publisher of the Profit Radar Report. The Profit Radar Report presents complex market analysis (stocks, gold, silver, euro and bonds) in an easy format. Technical analysis, sentiment indicators, seasonal patterns and common sense are all wrapped up into two or more easy-to-read weekly updates. All Profit Radar Report recommendations resulted in a 59.51% net gain in 2013. Are Gold and Silver Revving Up for Another Leg Down? Believe it or not, gold is one of the best performing asset classes of 2014, but today’s drop is the biggest this year. Here’s the simplest explanation of today’s drop and why eventual new lows are likely. Gold hasn’t gone anywhere fast in a few weeks, but is down 20 points today. Wow, there are many reasons, but no unanimous consent. According to Forbes, gold is down because the S&P 500 and dollar are up. CNBC blames ‘Chinese support,’ whatever that means. The following piece of gold trivia shows that every investor could easily see why gold is down today. 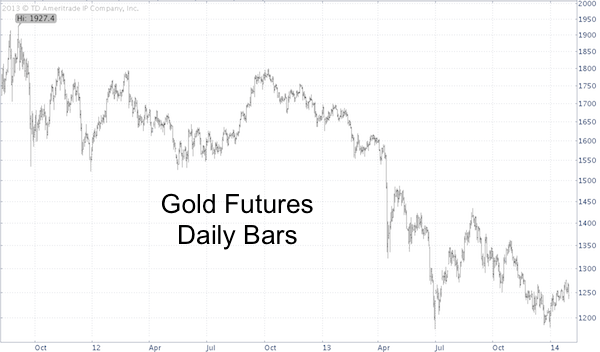 All the information needed is contained in the gold chart below. Can you see why gold is down today? If you can’t see it, look at the second chart. What a difference just one line makes. The silver chart paints the same picture, even more compelling. 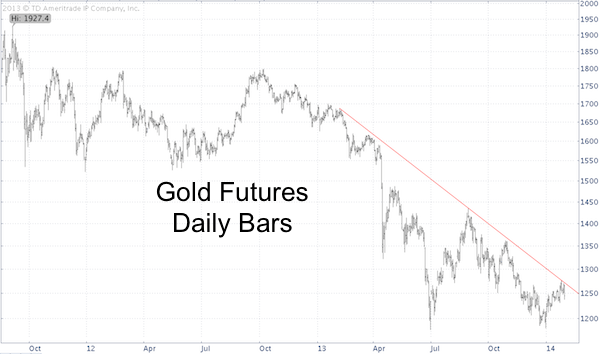 The Profit Radar Report has been watching the gold and silver trend line for weeks. Initially they acted as a magnet and drew prices higher. Lately, they have acted as resistance and rejected price. Although I prefer to analyze the purest representation of an asset, it’s noteworthy that the chart for corresponding gold and silver ETFs, the SPDR Gold Shares (NYSEArca: GLD) and iShares Silver Trust (NYSEArca: SLV), look similar. What about the longer-term outlook for gold and silver? “Gold prices have steadily declined since November, but we haven’t seen a capitulation sell off yet. Capitulation is generally the last phase of a bear market. It flushes out weak hands. Prices can’t stage a lasting rally as long as weak hands continue to sell every bounce. Gold sentiment is very bearish (bullish for gold) and prices may bounce here. However, without prior capitulation, any rally is built on a shaky foundation and unlikely to spark a new bull market. Any gold and silver rally prior to a new multi-year low seems doomed. 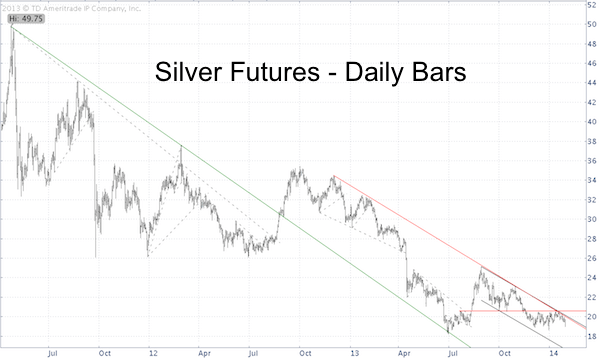 Nevertheless, the string of higher highs and lower lows has yet to be broken and a close above the highlighted gold and silver trend lines would temporarily extend the current bounce and unlock higher targets. How low will gold and silver have to go? There is a strong confluence of trend lines (similar to the ones highlighted above) that should act as a magnet for prices and serve as a foundation for a sizeable rally. Detailed targets for a lasting low are outlined by the Profit Radar Report. Talk about a classic catch 22. The Federal Reserve has been buying Treasuries to depress interest rates and spark the economy. With a bloated balance sheet, the Fed needs the help of its arch enemy to unload assets. 1,273%. 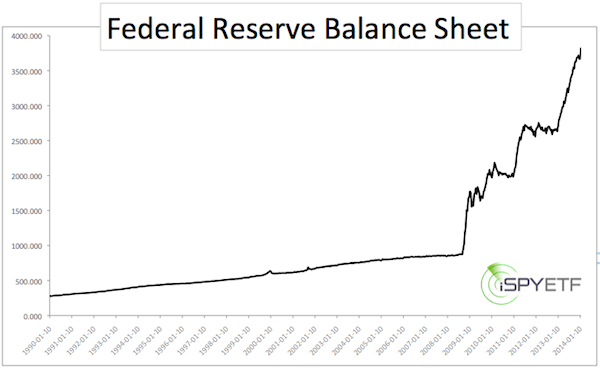 That’s how much the Federal Reserve’s balance sheet has mushroomed since 1990. As of January 22, the Federal Reserve owns $2.228 trillion worth of U.S. Treasuries and $1.532 trillion worth of mortgage-backed securities. Various other holdings bring the Fed’s balance sheet to $3.815 trillion. The chart below provides a visual of the sharp balance sheet increase since 2008. Buying those assets is the easy part, but how will the Fed unload them? The Fed’s Enemy – Who? The Federal Reserve engaged in massive quantitative easing (QE) to depress interest rates. Low interest rates forced investors into stocks and defrosted the frozen credit markets. By extension, QE drove up stock indexes like the S&P 500 and Dow Jones (NYSEArca: DIA). Bernanke termed this the ‘wealth effect,’ which the Fed hoped would spill over into the economy. 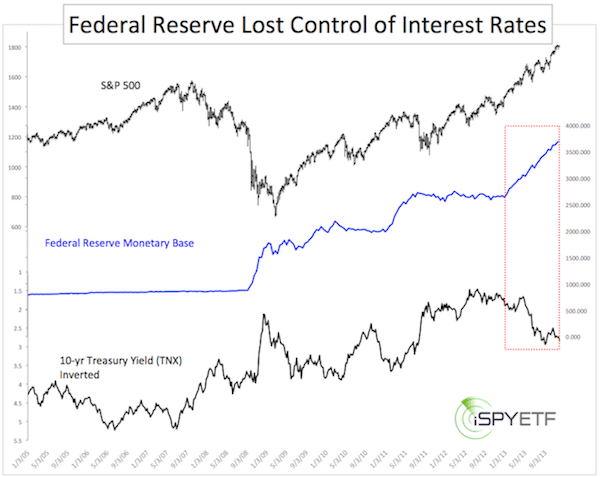 The Fed’s biggest enemy is interest rates, rising interest rates to be exact. Particularly important is the 10-year T-note yield. Rising interest rates make Treasuries and Treasury Bond ETFs like the iShares 20+ Year Treasury ETF (NYSEArca: TLT) more attractive than stocks. Rising interest rates also result in higher loan and mortgage rates, which are speed bumps for the economy and real estate. The chart below, published on December 12, plots the S&P 500 against the Fed’s balance sheet and 10-year Treasury Yields. Yields are inverted and the chart shows that the Fed has lost control over yields. The Federal Reserve is the biggest buyer and owner of Treasuries. The Fed can print money and buy securities all day long. But, who will end up buying all the Treasuries the Federal Reserve has amassed? What happens when the Fed becomes the seller? The Fed can’t print buyers. There has to be a demand or the Fed (if possible) has to create a demand. What makes Treasuries attractive? High yields, which ironically is exactly what the Fed is trying to avoid. High yields are bad for stocks and bad for the economy, but may be the Fed’s only hope to eventually unload assets. There’s another caveat. High yields translate into lower prices. As yields rise, the Fed’s Treasury holdings – and Treasury ETFs like the iShares 7-10 Year Treasury ETF (NYSEArca: IEF) – will shrink. Are there other alternatives? How about doing nothing and let the free market do its thing. Perhaps that’s what Bernanke and his inkjets should have done all along. There is another problem largely unrelated to QE and the Federal Reserve. It’s ownership of U.S. assets (not just Treasuries). We know that the Federal Reserve owns much of the Treasury float, but more and more U.S. assets are falling into the hands of foreigners. More and more U.S. citizens have to ‘pay rent’ to overseas landlords. Trading is tough business, but trading the VIX is even tougher, because you are betting ‘against the house’ many times. Here’s how to avoid the force that eats into your profits and make it work for you. Based on Bloomberg data, an unknown trader sold about $18 million in VIX (Chicago Options: ^VIX) calls on Monday. At the time of the trade execution the VIX was trading near 19. Many of the sold calls had a strike price of 22 with February expiration. This is a gutsy trade, but is it gutsy smart or gutsy stupid? The seller of a February 22 VIX call commits to selling the VIX at 22 on or before the third Friday of February. Obviously, no one wants to buy the VIX at 22 as long as it trades below 22. Therefore, the above trade will be profitable (seller gets to keep the premium) if the VIX remains below 22. 1. 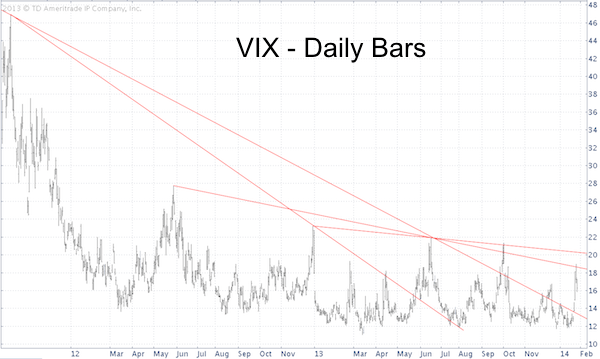 The VIX chart below (published in Sunday’s Profit Radar Report) shows overhead resistance at 18.60 and 20.30. 2. The VIX often peaks before the S&P 500 bottoms, creating a positive divergence. This means that even another minor S&P 500 (NYSEArca: SPY) low may not translate into a higher VIX high. 3. Bearish VIX strategies benefit from contango. Contango is a condition where the VIX futures (price of VIX in the future) trade at a higher price than the VIX spot price (current price). Contango is in essence a premium. The further away the expiration of the futures, the higher the premium. Some research on the iPath S&P 500 VIX Short-term Futures ETN (NYSEArca: VXX) suggests that the cost of contango is about 0.25% – 0.45% per day. Contango usually occurs when the VIX trades below 25. The opposite is true as well. Contango erodes gains of bullish VIX strategies. To illustrate: For my personal account (more or less as an experiment) I bought a March 12 VIX call, which gave me the right to buy the VIX at 12. I bought the call on January 13 for $3.20 when the VIX traded at 11.84, and sold it on January 27 when the VIX traded at 18.40. The VIX surged 55%, but my VIX call, a highly leveraged vehicle, gained ‘only’ 40%. The iPath S&P 500 VIX ETN (NYSEArca: VXX) gained a maximum of 20% over the same period of time, and the 2x leveraged VelocityShares Daily 2x VIX ETN (NYSEArca: TVIX) returned no more than 37%. Keep in mind that this was an extremely well timed VIX trade. If you get the timing wrong, contango will eat into profits and emphasize losses. The VelocityShares Daily Inverse VIX ETN (NYSEArca: XIV), an inverse VIX ETN, tends to benefit from contango when the VIX is trending lower. XIV somewhat mirrors the call selling strategy explained above. It’s said that buying climaxes take place when stocks are passing from strong hands to weak ones. The facts tend to support this thesis and the notion that late-coming mom and pop retail investors bought their ‘ticket’ just before the roller coaster ride starts. 90 S&P 500 component stocks saw a buying climax last week. That means that 18% of all S&P 500 stocks made a 12-month high last week, but ended the week with a loss. More S&P 500 buying climaxes were only seen three times in the last decade (November 2004, April 2010, May 2013). 22% of Nasdaq-100 (Nasdaq: QQQ) companies also saw a buying climax. Some of the more popular Nasdaq reversal stocks include high-flying Amazon and Priceline. Investor’s Intelligence reported 495 NYSE buying climaxes. 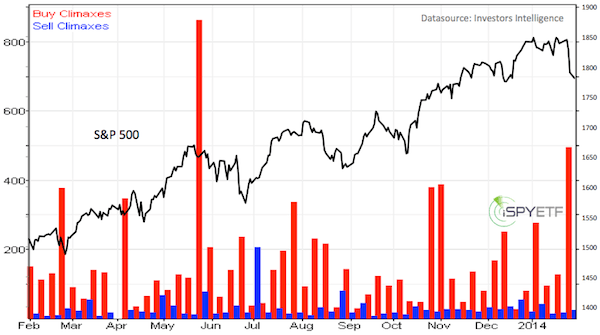 The chart below plots the number of buying climaxes reported by Investors Intelligence against the S&P 500 Index. Historically, the S&P 500 (NYSEArca: SPY) and Nasdaq have rarely been as overbought as in December/January. The high amount of buying climaxes caution that the smart money is exiting while the not-so-smart money has come late to the party. 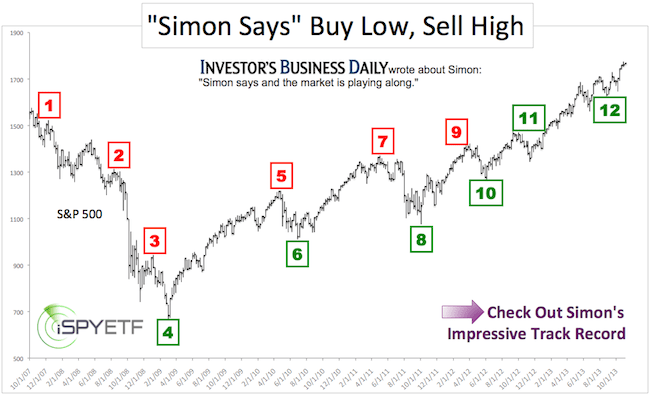 For much of 2013 the S&P 500 adhered to two repetitive bullish patterns. In 2014 it rejected both patterns. The effect of this change of character is already visible, but will it lead to much more damage? Persistence below resistance leads to higher prices. Quickly recovered dips below trend line support lead to higher prices. 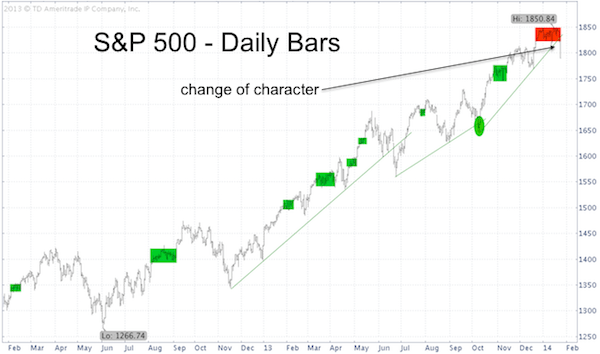 The S&P 500 chart below illustrates the bullish outcomes of both patterns with green rectangles and circles. The red box highlights a change in character. For much of 2014 the S&P 500 was bumping against resistance at 1,855. In 2013 that kind of persistence around resistance would have been followed by a bullish break out. Not in 2014. Furthermore, the S&P 500 (NYSEArca: SPY) dipped below trend line support on Friday. Unlike the October 2013 instance (green circle), where a dip below trend line was quickly reversed, the S&P 500 of 2014 continues to head south. The Dow Jones even sliced below significant long-term support. 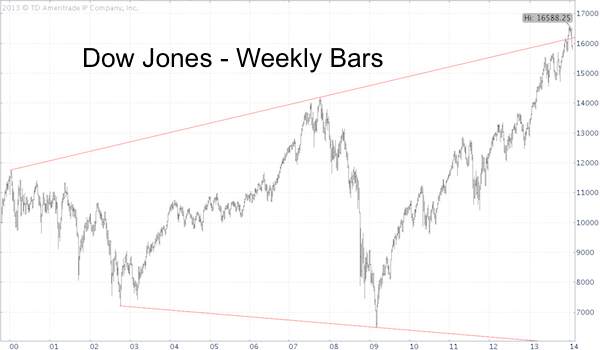 The weekly Dow Jones (DJI: ^DJI) bar chart below shows a 15-year support/resistance line. The Profit Radar Report referred to this support/resistance line many times and warned that a drop back below it would spell trouble. No doubt we’ll soon see a powerful bounce, but there are persuasive additional reasons why this correction will ultimately have further to go.